14 on 103 McKenzie - St Lucia Accommodation. If you have a love of the outdoors or love to explore nature and a sense of adventure, St Lucia 14 on 103 McKenzie is the one for you! This 6 sleeper luxurious, self-catering, air-conditioned chalet is perfect for families looking for an active scenic holiday. This is also ideal for overseas visitors looking to explore Africa and the corporate traveller who needs to feel at home. St Lucia has it all, sandy beaches, hippo and crocodile boat cruises, hikes, snorkelling, deep sea fishing, crocodile sanctuaries, turtle tours, horse riding, restaurants, pubs, curio shops and a whole lot more. Golfers will enjoy the golf course in the Monzi village 15 kilometres from St Lucia. St Lucia is part of the Greater Isimangaliso Wetland Park, South Africa’s First World Heritage Site and close to the Hluhluwe/Imfolozi Big Five Reserve. St Lucia is located on the Kwa-Zulu Natal North Coast, 2.5 hours’ drive from Durban and 2 hours’ drive from King Shaka Airport. 14 0n 103 McKenzie is a luxurious 6 sleeper, self-catering, air-conditioned chalet, within walking distance of the shops and restaurants in the quaint street of St Lucia, making your stay stress free and relaxing. The allocated parking is secure and directly in-front of the entrance to the unit. Once off complimentary amenities are provided which includes, soap, shampoo, tea, coffee and sugar. A modern kitchen that is fully equipped with a dish-washer, washing machine, fridge, microwave, oven and a counter top stove. The cosy dining area boasts a 6 seater table and chairs, a large flat screen HD TV with DStv; SABC 1-3, eTV, all Super sport channels, kykNET, Disney channel, M-Net, M-Net Movies Premiere, M-Net movies Comedy. This area is ideal for late night chats and socialising with family or friends. The main bedroom includes: king size bed, dressing table with hairdryer plenty of cupboard space and a private shower. The 2nd room has 2 single/twin beds and a large cupboard. The 3rd room is an open plan area and has a double bed, cupboard and HD TV. The apartment has 1 bathroom with a shower, toilet and basin. Hand and bath towels are provided. The unit has an open patio with a 4 seater patio table and chairs, garden bench and a BBQ for guests to enjoy. Parking is available right next to the chalet which is very safe. You may however, find the parking a bit tight, but you can also park elsewhere on the premises, please enquire at reception. Large communal swimming pool (use at your own risk and children under 13 must be accompanied by an adult) with sun loungers, bar, pool table and dart board. A large TV is available in the Lapa where guests can gather to enjoy movies and/or sporting events. Adventure activities can be booked at reception. Units are serviced daily (washing of dishes and making of beds). The resort offers breakfast at the Lapa that overlooks the pool, please book at reception, current rate is R120.00 per person and consists of a full English breakfast. St. Lucia Estuary Rate Payer Association has appointed Alpha Security as the company to ensure that St. Lucia will be safe for residents and holidaymakers alike. They have installed a radio system and cameras will soon be deployed at strategic spots. 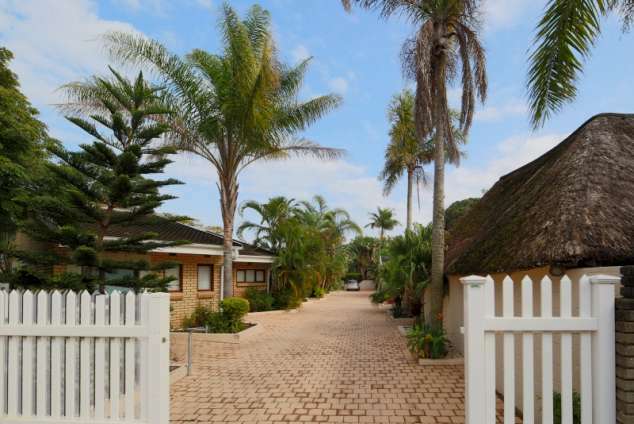 The resort where 14 on 103 Mc Kenzie is located has gates at the rear with PIN access and a roaming guard from 19:00 in the evening until 07:00 in the morning. 14 on 103 Mc Kenzie is a sectional title chalet that is privately owned and obtained a 4 star grading as part of the St. Lucia Safari Lodge resort. 56 page views since 10 Apr, 2019.